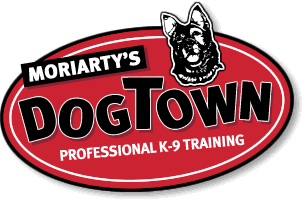 Moriarty's Dog Town, Professional K-9 Training, dog training - What times, days and locations are available for private training sessions? How do I house train my puppy or new dog? My dog won't stop barking? How can I stop my dog from chewing? My dog is showing aggression towards other dogs, what should I do? I am interested in Dog Town training services, how do I sign up for group classes? or private dog training classes? How long are the private training sessons? How many private sessions would be needed to train my dog? At what age should I start training my new puppy? Where are the group classes held? How much is your private dog training package? What times, days and locations are available for private training sessions? My dog is very smart and a good worker, I would like to train for some sort of compitition. Can you direct me to the correct disipline for my dog and help me train for it? My dog is aggressive towards other dogs; how can I fix this problem? How many years have you been training dogs? Brixx and I working on our basic Rally skills. Rally is a great way to get started in competitive obedience. Also a great way to kill the winter months! Brixx in his early days of Rally practice. He went on to receive his URO1 title a few weeks later! > Dog Training > FAQ - Frequently Asked Questions > What times, days and locations are available for private training sessions? I am available for private training sessions seven days a week at any reasonable time. I am typically booked out 1 to 2 weeks ahead, so with some advanced notice we can usually get you into the schedule. I can come work with you and you dog at your home, or you can come work at my training fields in Wilbraham, Ma. We serve the Western MA area with our dog training services. Including the towns of: East Longmeadow, Wilbraham, Agawam, Springfield, Longmeadow, West Springfield, Chicopee, Monson, Ludlow, Hampden Westfield and more. We also serve Northern CT towns of Somers CT, Enfield CT and Suffield CT.
Moriarty's Dog Town. All rights reserved.